Star Wars Surprise Box now available! 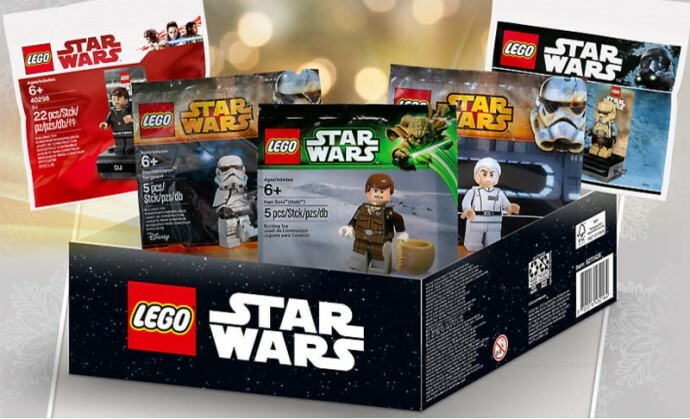 5005704 Surprise Box is now free with any Star Wars purchases exceeding £85 or €85 at shop.LEGO.com in Denmark, Austria, Germany, France, Belgium, United Kingdom and Sweden. The box contains a selection of five polybags or keychains along with an opportunity to win a platinum R2-D2, a sterling silver R2-D2 or a graded TC-14 minifigure. If I'm buying from the U.S. what link would I use? I've added a link for US folks although the offer doesn't seem to be running there at the moment. ^^^ I thought the US have already had their chance for this, many weeks ago..
Any new polybags or one from previous years? Seen some pics R3 - M2, Darth Vaders pod?? I am convinced Lego execs have some kind of dare going on. What can we sell the customers as great but really its awful. Looks like in say 1000 boxes of Star Wars stuff we have been able to get, and like others I think I have all of you have a 7 in 1000 (or however many boxes they have) chance of winning a ticket. Presumably you then have to add that to your next Lego.com order. And unless you want something new and big £85 is difficult to spend on Star wars that isn't 20% off on Amazon. Not a big fan of not knowing what you get. For all I know you can get a bag of 4 DJ's and a keychain. I'm always amazed people who will look a gift horse in the mouth. It's FREE. You spend £85 on Lego, you get £85 worth of Lego, PLUS this. You're not being forced to do anything. I don't know how to read your rant. Do you even grammar? Would be nice to own a platinum R2-D2 Though. On the one hand, neat. On the other, there isn't 85€ of Star Wars sets I want to buy at the moment, and if there was, I would not be buying them full price straight from Lego. I'm surprised this comment section hasn't yet attracted any outraged black VIP cardholders. Imagine getting a box with 5 keychains, hahaha. I imagine the keychains will be picked from Krennic and Jyn Erso. Which just happen to be the only two SW items in the sale section on lego.com (UK). Looks like it has sold out in the UK. So, the german site doesn't add it to your basket right now, so it is gone nevertheless, I presume. Not that I wanted a box full of keychains and outdated promo bags. But remarkable anyway. In Belgium also not anymore added to your basket. Was earlier in store today so grabbed there one. Anyone get anything more unusual ? Out of stock already just 22 hours after being put to sale :( And It was supposed to be a 5 day promo and I understand the whiles stocks last thing but surly longer than 22 hours. I sorta wanted to have one but never mind. Looks like it's all academic now, but I was considering making a purchase earlier to get this, however as soon as I noticed the phrase "or key chains" in the article my interest faded significantly! I see it like this: it is a great offer if you are already planning on getting an 85+ GBP/EUR Star Wars set at the moment. For me, I am not looking for any Star Wars sets currently, plus I have almost all of the proposed goodies, am not interested in keychains, and am always unlucky in prize draws (why should this one be any different). I'd been humming and hawing, there wasn't a set or sets I'd been holding off on buying for the next promotion. Looks like my indecision has been taken care of if they've used up their promotional stock already! Anyone know if stores have any? Just checked here in Austria, still available and yes I have one on the way sorry but i'm a sucker for competitions and freebie offers. What's that, LEGO? Making people get something they probably already had with the promise of a solid metal version of one of the components? ...sorry for that. As I was saying, give me ten please. Anyone managed to enter. When ive tried it says web page unavailable. Thanks. Until this morning, the lswmysterybox site did absolute nothing on my side. Does anybody know how long it will take them to send me my platinum R2? Not blown away. but not disappointed.